"When I say 'marsh,' you say 'mallow!' Marsh!" "Mallow!" 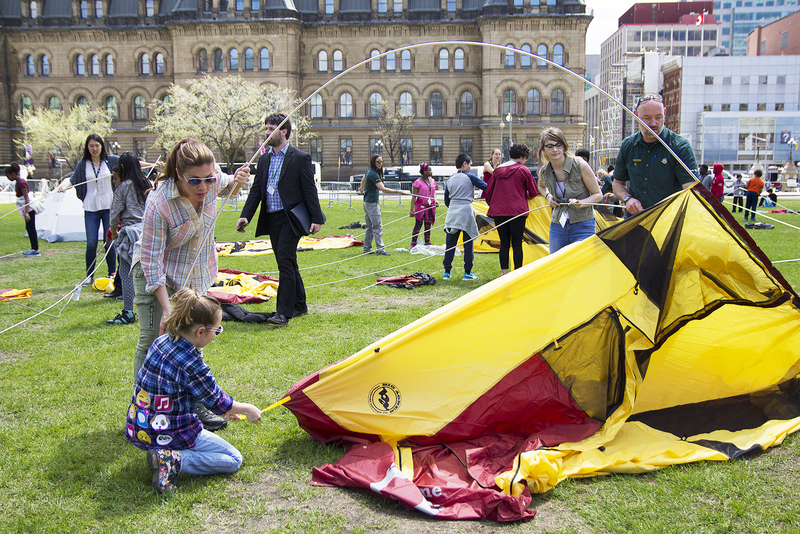 The East Lawn of Parliament Hill was temporarily transformed into a campground that rang with the sounds of campfire songs and chants May 12 as Parks Canada brought its Learn to Camp program to the heart of the capital. For two hours, students from St. Anthony School in downtown Ottawa and the University of Ottawa, many of whom had never camped before, learned how to set up and take down a tent and took part in games and activities aimed at piquing their interest in exploring the great outdoors. "Camping is an essential part of the Canadian experience," said Ed Jager, Director of Visitor Experience with Parks Canada. 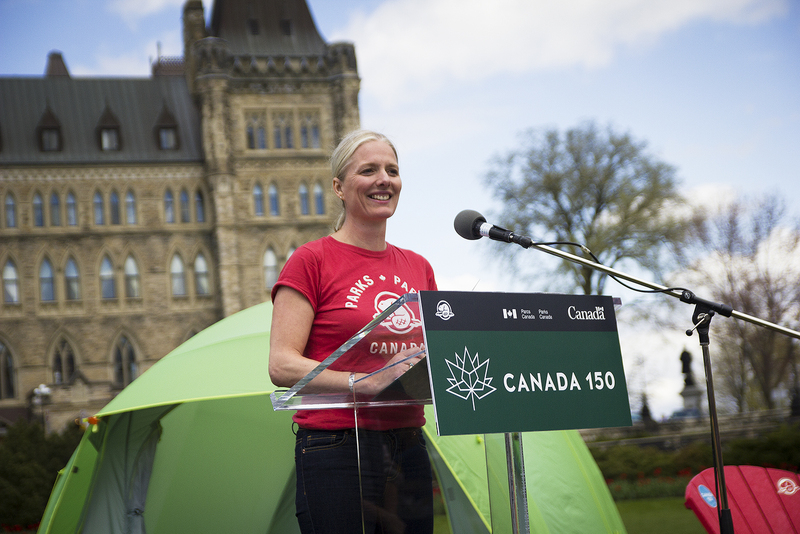 "Our objective is to help urban Canadians enjoy the outdoors and experience our national parks." Christina Cinzah, 10, said she enjoyed learning how to set up a tent, but was also excited to have met the Prime Minister's wife, Sophie Gregoire Trudeau, and daughter Ella-Grace, who were on hand to help with the activities and share their own family's love of camping. Gregoire Trudeau is Parks Canada's Honourary Guide for families and since February has appeared at various events aimed at encouraging more people to visit Canada's national parks and historic sites, particularly this year, since admission is free. "Wherever we come from, whatever we do in life, when we meet in nature, we find out we're all the same," she said. 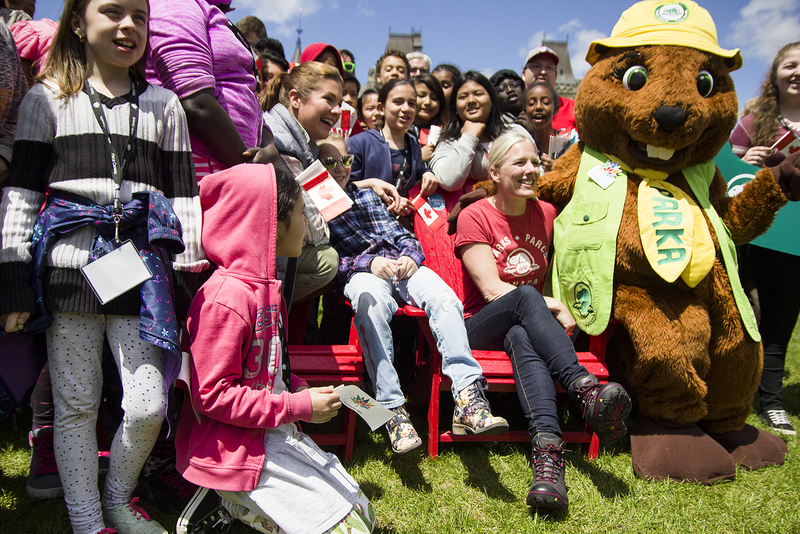 Since 2011, some 10,000 Canadians have participated in Learn to Camp events across the country. This year, events ranging in length from a half-day to a full overnight experience will be held at most of Canada's easily-accessed national parks and historic sites. Participants will learn the basics like how to set up a campsite, how to safely build and extinguish a campfire, and how to cook in the outdoors, as well as how to make the most of their camping experience through activities like hiking, canoeing, and wildlife-spotting. "It's a good way to spend time with your family and enjoy the weather and nature," said Calvin Tran, 12, who has attended summer camp at Ottawa's Christie Lake Kids but now hopes to do more camping. Registration for this summer's Learn to Camp programs opened last week and spots are going fast, so if you're new to camping but looking for a fun way to experience Canada's natural beauty in the country's 150th year, check out Parks Canada's website to find a program near you.